Our Brooklyn Pest Control Exterminator will identify the source of the pest infestation & create a customized treatment plan to eliminate the pests. 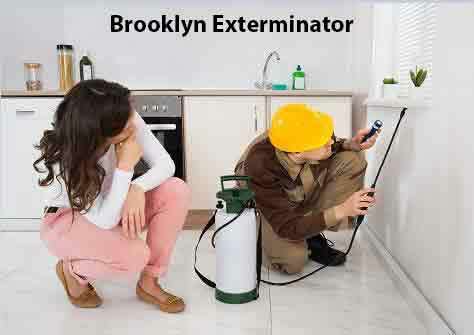 Let us be your Brooklyn Exterminator, Give Us A Call Today. 1-844-305-8999. Don’t let these pests endanger your family’s health and destroy your property. Contact our Brooklyn Exterminator at Dependable Exterminating Company for a free quote. We have been exterminating pests for 28 years. Rats are some of the most troublesome and damaging rodents in the United States. They eat and contaminate food, damage structures and property, and carry a countless number of diseases. Most importantly are harmful to Humans and Pets. New York City officials say some Brooklyn neighborhoods are seeing more rats because of all the development that forces the rodents from their homes. Our Brooklyn Exterminator at Dependable Exterminating Specialize in rat control utilizing rat bait stations and rodenticide products. At Brooklyn Pest Control We have the know how to get rid of rats. Cockroaches and Waterbugs can contaminate your food and transmit dangerous bacteria. Cockroaches have been reported to spread at least 33 kinds of bacteria, six kinds of parasitic worms and at least seven other kinds of human pathogens. Cockroaches prefer to live in warm, humid places close to food and moisture sources. They are frequently found in residential and commercial kitchen environments, and bathrooms. Cockroaches are both unpleasant and unsanitary. Because Cockroaches and Waterbugs dislike light, they disappear during the day time into dark places, including the undersides of appliances like stoves and refrigerators, underneath sinks or other installations, near plumbing, inside light switches and behind wall paneling or doorjambs. There is never just one Cockroach or Waterbug, wondering how to get rid of cockroaches call our Brooklyn Exterminator at Dependable Exterminating. As the days get colder, flies seek the warmth of your home. Flies are everywhere, and they can bite, spread disease, and contaminate food. More than 100 pathogens are associated with the house fly, including Salmonella, Staphylococcus, E. coli and Shigella. These pathogens can cause disease in humans and animals, including typhoid fever, cholera, bacillary dysentery and hepatitis. Flies, typically considered a nuisance, exist in all regions of the United States. There are more than 240,000 different species of flies in the world. Approximately one third of them, including mosquitoes and gnats, can be found in the United States. The most common flies are the Blow Fly, Fruit Fly, Drain Fly, Flesh Fly, House Fly, Cluster Fly, Horse Fly and the Crane Fly. See our Fly Chart on our Fly Pest Library Page. At Brooklyn Pest Control we specialize in the elimination of all types of flies. Give Us A Call Today. 1-844-305-8999.